Eighty-six sixth graders from Paynesville Area Middle School attended winter camp at the Long Lake Conservation Camp in early January. The Press selected eight essays from sixth graders to describe their experiences in the school's 26th trip to winter camp. I had a lot of fun at Long Lake Conservation Center. The people that were working up there with us were very friendly and nice. They explained the activities as best they could. This resulted in less questions and more time for the activities. We were always busy because they were very good at arranging things for us to do. All of the things we did were extremely fun. Winter camp also gave the teachers and adults who came with a time to be with us and they had fun as well. Jeff Albright, Kim Magedanz, Chelsey Hansen, and Chris Block tend their fire during the wilderness meal. My first activity we did was "Quick Frozen Critters." This game was very fun. It was like tag mixed with flag football. The object of the game was to run to one side of the area without getting caught by the "lynx" and grab a cookie, then run back all without being caught. There were areas in the field that you could step in and you wouldn't be able to get caught. If you couldn't get to one of these you simply had to freeze. You could not move at all or you could get caught. I wasn't good at it, but I wasn't bad at it either. Most of the people in my group enjoyed this activity. Our next activity was cross country skiing. This was the most fun thing we did, in my opinion. We had to go around the lake, though. That made skiing a little less fun. Most people, like myself, were not good at this at all. The only part I was good at was getting up. Everyone still had a lot of fun. I did get better as I went around, but, like everyone, I kept falling over. Many people had a lot of fun at this event. All of us had to go around the lake twice. It was very tiring. My friends and I all agree we would love to try to do this again. Alpha Wolf was an event that we did on the second night. We had to howl like a wolf and find the Alpha Wolf. The wolf wasn't real it was just a staff member from the camp. He was really good at howling. My group did find the Alpha Wolf, but we were one of the last groups to do so. Still, this was very fun. It was hard to find him with only the ability to hear him. I also liked howling, it was really fun. Some people said that the other group got a howl back at the end from a real wolf. This game was done at night so it was very dark. Snakes Alive - I like Snakes Alive a lot because I was one of the people who got to go up and have Connie, the snake, in my hair. It is really funny because I don't even like snakes! Whenever I see a snake at home, I freak. My sister, mom, and grandma couldn't believe I let a snake slither in my hair. They were disgusted. At the time I was really nervous and had butterflies in my tummy. It really made me happy because I always wanted to conquer one of my fears and I did. Pat, the counselor in charge of it, said that after class if anyone wanted to stay they could hold Connie. And again I stayed after class. One of my friends put my camera on my knee when I was holding Connie. The camera slid down my leg and freaked me out. Boy was I scared. I told Sam to never do that again! Snakes Alive was my most favorite activity at winter camp. Alpha Wolf - I would say Alpha Wolf was my second favorite activity. Alpha wolf is the leader of the pack of wolves. My group had to find the alpha wolf by howling and it would howl back. Next, you will have to follow his howl and then you will find the alpha wolf. It was during the night, so it was dark. At first I thought it would be freaky. The instructor made the alpha wolf seem real, so I was scared. After we got outside and our eyes focused in the dark it wasn't that scary. Table eight (my group) was the first group to get to the alpha wolf because Mr. Bowden was assigned to my group and he told us, "the group that howls less and listens most will get there first" we howled twice. When my group got to the alpha wolf it growled at us and was kinda scary but cool. Quick Frozen Critters - Quick Frozen Critters was a cool activity. The director taught me a lot about prey and predator. A lynx and a hare are predator and prey. They both have hair that changes colors during a change of season to help them be camouflage. We played a game of Quick Frozen Critters. For the first game I was a lynx. The lynx tries to eat the hares and the hares try to get away. There are three ways for a hare to try to get away from the lynx: you can freeze, you can run, or you can hide in a hula hoop. I survived once and was eaten twice. There was a lot of cool things at winter camp! I also liked skiing; I fell three times. On the compass course my partner Jeff Albright and I got first place. That was cool! One bad thing is three girls got their money stolen. Their names were Kayla Lieser, Ashley Ogdahl, and me. Ashley and Kayla got their money back, I didn't. My friend Natasha F. tore a ligament in her knee. She did it by falling over a log. One of my favorite activities at Winter Camp was Alpha Wolf. What we did was we went to the Great Hall in the North Star Lodge and we talked about wolves. We talked about where they lived, what they ate, how big they were. I learned a lot of things I didn't know before we came up here. For instance, I learned that Florida doesn't have wolves, I learned that wolves eat deer, mice, rabbits, foxes, livestock, and they will probably eat other things too if they can't find anything else. Also, I learned that we have more wolves now than when we did when settlers first came. Another thing I learned that wolves were killed by farmers because they would kill their livestock. Then we went out and we all had to hang on to a rope, well, the people in our group had to, and we went out into the woods and we howled. Then the Alpha Wolf would call back until we found him. My group was second. Most of the people in my group were scared because the Alpha Wolf would hide behind a tree and jump out at us. One kid in my group got really, really scared because the Alpha Wolf grabbed his leg. I thought it was kind of funny. It was really fun. When we went there and back, there were a lot of branches in the way. There was also a lot of rocks and logs, but no one got hurt in this activity. That was good. Another fun activity was Deer Browse. We met in the Lake Side Lab. She talked to us about different species of deer and their genus and species name in Latin. I forgot what they were. Afterwards we went outside and played a game. First, we each had to go in groups of three, we got one rope per group, and we had to hang onto the rope the whole game with one hand, then we had to go get twigs and put them in a little bag, and then we had to stay away from the grownups because if they tagged us we would have to be out of the game. At the end if we came up with 46 grams of twigs you would survive. My group came up with 62 grams of twigs so we survived. Who Give A Hoot was an activity about owls. It was so fun. We met in the Malcolm House. I thought it was funny when a girl went to the front of the room and dressed up like an owl. We talked about the different parts of the owl that helps it survive. I learned it can turn her head three-fourths the way around. Afterwards we played a fun game where the mice had to get past the owl into the safe room. The owl has a flashlight and has to try to shine the light on the mice. If the light shone on the mice they were dead and went to mouse heaven. Winter camp was just an all-around great time. I liked the meals. These are my top three meals: #1 was pancakes; #2 was pizza; and #3 was turkey. It was fun being in our dorms. In my dorm, we would play poker. Some of the time I would actually win. We had a Wilderness Meal. That was where we went outside, built a fire, and cooked our food on the fire. X country skiing was fun, too. We went out and skied on the lake. It was a really fun trip. The game Alpha Wolf was very fun, scary, and exciting. We start out with our lunchroom table group at 8:30, and pitter pattered around, holding on to a long white rope. Our object of the game is to run through the woods and try to find the Alpha. Alpha is hiding somewhere. You howl if you can't find him. Other groups go out at the same time you do. Your heart almost stops beating as the wolf growls at you. The growls sound so real!! You've now, finally found the alpha and have to go sit down out in the dark by a tree and wait for the other teams to come. Alpha Wolf is the leader of the pack. Every other wolf follows him. He is the one who fights off the nasty predators away from the pack. There is one back-up wolf for the Alpha Wolf if he ever gets killed, or hurt. It was my very favorite game that we played. Now, for the wilderness meal. Again, we were still with our table group. The people in our group were Bill, Jessie, me, Danny, Eric, Tyler, Katie, and Leah. I was the fire starter for our group, and Jessie was the master chef. We didn't drop any food and have to eat it because if you do drop anything in the fire, you still have to eat it. Our group got many pieces of birch bark for our extreme help if we can't get it started. My group ate all of our food, so we got double thumbs up. The compass course was fairly tricky, but I made it in 23:00 and some seconds. At every tree we had to go to, there was a board that said what direction that we were to go. My partner was Eric Brinker. Kella Bugbee (my mom) did the race and got 13:00, so she was put on the women's record! We had to walk back and forth just to make sure that we did it correctly. Eric and I had to go far out in the woods to do this activity. I absolutely love the scrumptious food, especially the pizza and the mouth-watering chocolate birthday cake. The hot dogs that we had outside that we ate for the wilderness meal were fine. Apples are my second favorite food, so I loved the apples that we had at our meal. The cooks were excellent cooks. We thanked the cooks on our way out. I really liked the game Alpha Wolf, trying to get through the woods without a flashlight. We, also, had to work as a group to make it. Our table made it, but we were the last group to find the Alpha. For awhile I was the leader. See I tried to guide us through the woods. It was kind of scary, because you don't know if you are lost or not. When we howled as a group, it sounded really cool. It was hard to see in the dark. Seeing in the dark is very hard, especially when we all had to hang on to a rope. Alpha was kind of like our wolf leader of the pack, and Alpha was a girl counselor. It was fun when we made the wilderness meal. Being the master chef, I had to make sure everyone got the amount of food they wanted. I had to get the food, and make sure it was the right amount. Having the experience of making your own food in the wilderness is really fun. Able to work with fire and not get in trouble with my parents was really cool. We had to make sure we had all the cups, bags, twisty ties, and apple cores. When we were done with the fire, we took our cold water and poured it over the fire to make sure it was out. There were some people who mixed it with sticks then. Everyone got hot dogs, an apple, a bun, cheese, a cookie, and hot chocolate. When we played Quick Frozen Critters, I always was a hare. Never was a lynx. It was fun, because you were on one side and you tried to get to the other side to get food without getting caught by the lynx. There was these hula hoops that we pretended were bushes that we could hide in. That was one way a hare wouldn't get caught. Another way was if you stayed still until the lynx was gone. See if we got three things of these little blocks of food, we would still be living and we got to sit and watch everyone else. There was many other fun things about Winter Camp. In our room on Wednesday night, we tried to stay up really late. We only made it to one o'clock in the morning. Our bunk room wasn't tired the next day. It was also fun being the caters. What we would do is we would go earlier then the others and set up our table for everyone to eat. On Friday for some reason we were really tired. The people beside us were really loud, and they kept flushing the toilet. If I had the chance to go again, I would. I had a lot of fun at Winter Camp. Alpha Wolf was one of my favorite things. being in the dark was what I liked the most. Some girls were scared and thought there was a real wolf. We are older now and shouldn't be afraid of the dark or think that it was a real wolf in the woods. I just thought that it was a very fun experience to be out in the woods in the dark. Colby was our leader. I thought he was a really good leader because my group was the first one to find the wolf. When we found the wolf, it jumped out and scared all of us. 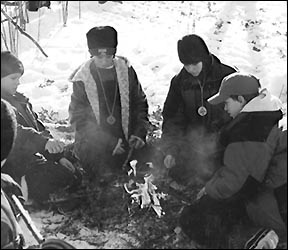 The Compass Course was my all-time favorite thing in Winter Camp. I was the first one to return in four groups. My time was 11 minutes and 22 seconds. That was a very fast time and they put it on the record board. Only one other kid made a record beside me. There was also only one other boy who went solo on the course. In my opinion, it would have been more fun in the dark with flashlights. It was a really fun experience though! The Wilderness Meal was really fun! I didn't get to cook all the food, but I did get to help cook the hot cocoa. Our supervisor said that it wasn't often that hot cocoa is perfect. Most people in my group ate their food, but some of them didn't. Violations were a problem in my group. My group members and I had to do community service because we left a bag in the woods. There were a lot of fun things in Winter Camp. I really liked the game called Deer Browse. It gave us an opportunity to learn about a deer's struggle to survive. Tarin and I were in the same group and we did a really good job. We had to pick a certain amount of sticks and not get caught. Only one group survived out of about seven. My group was only caught once, but we did not survive. I thought that winter camp was really fun. If there's one thing I learned, it was "eat what you take." My favorite game was "alpha wolf." It taught me how to use my other senses like hearing or touch. They helped a lot in this game. The guy who was playing alpha wolf would howl and growl when you got close to him. That was pretty cool. Another cool game that we got to play was "deer browse." This game taught you how hard life is for the deer during the winter. We got to play this by taking a rope and having three parts which needed three people. One was the mouth, another was the eyes and nose, and the third part was the stomach. The mouth would take off little twigs off of little trees. When the mouth was done picking the twigs he gave them to the stomach. They were then put in the sack type thing. The eyes and nose told what way to go. The deer needs 46 grams of twigs to survive and be healthy. The most important thing of all is that out in the woods there are wolves that hunt you down and when that happens you have to sit and wait for 30 seconds. This activity wasn't really a game. It was building a fire out in the woods with only having one match. This was pretty simple but we had to keep it alive with birch bark. When it did go out we used the embers for heat and it was pretty good. Our hot cocoa wasn't very good at all. We had pieces of wood floating around in our cocoa so we dumped it on the fire. Another fun game we played was thicket. We had to hide behind a bunch of branches and logs, so the wolf wouldn't find us. The wolf couldn't move from its spot. When other people did get caught, they were very close to me so it was kind of hard. I thought that game was pretty cool! My three favorite things that I did at Winter Camp were Alpha Wolf, X Country Skiing, and Thicket. Alpha Wolf was an activity that we did at night. I thought that it was fun because we had to hold onto the same rope as your group and then we would get to howl. The group that I was in found the wolf second. Every time the other people would howl my group wouldn't because we wanted to hear the wolf howl so then we could find him faster. I thought that it was fun listening to the other people and the wolf communicate back and forth. It was kind of hard being quiet when we found the wolf because I wanted to laugh when the wolf scared the people. When he scared the other people they all screamed because they didn't know that the wolf was right there. 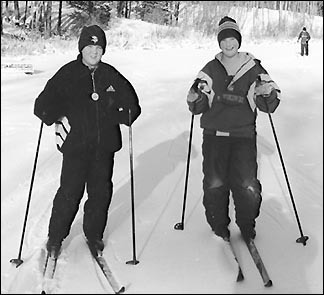 Cross-country skiing at winter camp were Aaron Frank and Colby Peterson. X-Country Skiing was fun, too. I would always fall down, but then I would always get right back up and go again. My legs got tired after that activity because you are moving your feet back and forth all the time. The guy that was teaching us how to ski was way ahead of me because I would always fall down. I made my own tracks with my friends that were in my group. I thought that it was easier to make your own tracks then it was to follow the other peoples. Thicket was also one of my favorite activities that we did. Thicket is where you have a wolf and all of the other people were deer. The wolf had to stay in one place and couldn't move their feet. The deer would go and hide in a thicket out in the woods and then the wolf would have to spot you out and then they have to say what you have on. Then you would be caught and you would have to be a caught deer. I got caught all three times that we played. I guess I am not the best deer there ever was, since I got caught all three times. Quick Frozen Critters was a fun game, too. There were four cones and two buckets on each side. There were five lynx and all the other people were hares. The lynx would have to catch the hares and the hares could stay frozen as long as they wanted but the lynx could baby-sit you. I got to be the lynx two times. It was hard to catch the hares because they were so fast. You really couldn't catch their flags that they had on because they were running too fast. Who Give A Hoot was an interesting game to play. There would be an owl and all the rest of the people would be mice. The owl would have a flashlight and the owl would have to try to hear you and if the owl heard you the owl would probably shine the flashlight on you. The mice had to crawl on all fours and they would have to be quiet and try to get past the owl. The mice who got caught would have to go to mouse heaven. The mice who got past the owl would not be caught and they would still be alive.